In his book, A Peace to End All Peace, historian David Fromkin outlined the lasting effects of the way the breakup of the Ottoman Empire was handled. One of Wilson’s Fourteen Points had dealt with the need to redraw boundaries of countries that had been within empires so that ethnic groups would be given their own countries, but this was obviously not accomplished either in Europe or in southwest Asia. Here is a pretty good overview of this book which you should read. The term “Balkanization” is often used to describe the kind of breakup that did occur. Balkanization means the breakup of a former country into many mutually hostile ethnic enclaves, as happened in the former Yugoslavia at the end of the Cold War. Since Yugoslavia is on the Balkan peninsula, the term is “balkanization.” The forces that led to the national boundaries that did occur included both native overlords as well as European powers seeking to advance their own aims in the region, as you will discover below. “The war ended with the British occupying the territory that was to become Iraq, Palestine, Trans-Jordan, Syria and Lebanon. With the Ottoman Empire destroyed, Russia paralysed by foreign intervention and civil war, and French influence limited somewhat by their minor military role in the Middle East, Britain’s military success made her the dominant power in the region. The resulting settlement, which fostered an instability that continues to be a source of conflict today, generated much controversy at the time and has continued to do so ever since. 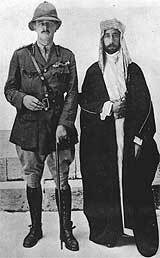 Employing bags of gold, the diplomacy of Lawrence of Arabia, and promises of Arab independence, the British had encouraged an Arab uprising in 1916 against the Turks. Although the Hashemite Arabs were rewarded with considerable territory, they and other Arab nationalists believed that they had been ‘robbed’ when the British did not fully deliver on their pledges of independence. They believed that the western powers, especially the British, had acted with arrogance, drawing borders and creating nations with little or no regard for the wishes of the local inhabitants. They argue, for example, that Iraq and Trans-Jordan were not simply British inventions, but owed their existence to a compromise between Hashemite imperial greed and well-intended British efforts to meet local needs and allay the fears and suspicions of their allies. The entire article on the BBC website is actually quite good, and begins here. I strongly recommend it to you if you wish to understand the genesis of the problems the modern Middle East has faced as a legacy of imperialism. In fact, there are links to several other history articles on this page, and so if I were you, I would use this (http://www.bbc.co.uk/history/) as one of my reference sources.